China is a market of markets, and the Yangzte River Delta region – the vast economic zone encompassing Shanghai and a cluster of around 60 cities in the hinterland with more than 100m consumers – serves as an exciting example of the dynamism and growth opportunities presented by just one of them. This region formed the focus for the second edition of Asiafruit Market Insight, China’s new conference event, which was held at Hangzhou’s deluxe JW Marriot Hotel on 28-30 May. More than 150 delegates from 20 different countries took part in the event, with more than two-thirds of them from companies and organisations based in China. Sharing his deep insights into the growth of the market in the Yangtze River Delta in the keynote address, James Sinclair from consulting company InterChina said the region was spearheading China’s food and beverage import boom. Food safety concerns – fuelled by the melamine infant formula crisis of 2008 and food adulteration cases since then – are one of the drivers of demand for imported fruit, but there are several others, he added. Such conditions are creating new opportunities for branded produce, and not just premium imported fruit brands such as Sunkist, Zespri and Dole. “We’re now seeing domestic brands move to grab a share of the higher prices,” said Sinclair, who pointed to the trend for local business tycoons to use their personal prestige to win consumer trust. TMall is the largest player in China’s e-commerce market, which is soon to become the biggest in the world, and the general manager of the group’s LifeStyle Department Edith Huang was on hand to explain how the company is changing the way people shop in China. “TMall now makes up 52 per cent of the entire B2C market in China, and nowadays people choose TMall not just for shopping but for fashion trends, like 5th Avenue in New York. We’re a congregating platform for brands,” said Huang. Another key advantage of this channel is the capacity to deliver produce to consumers much faster than traditional retail channels, and collect their feedback on each product, said Huang. 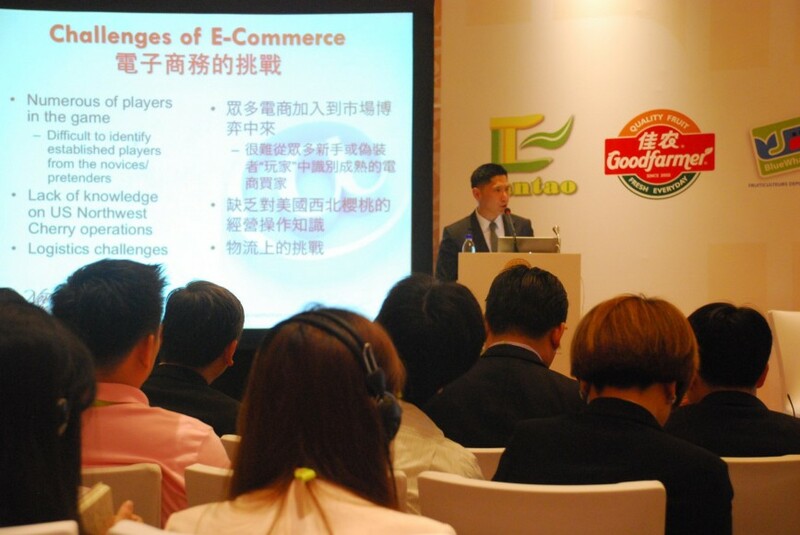 Loren Zhao of Fruitday, China’s leading online fruit retailer, explained how the e-commerce market has become fiercely competitive in China, with players rushing to establish a presence in every sector. Price competition is dominating, but he noted that logistics is becoming one of the key differentiators, with leading e-commerce players building in-house delivery capabilities. Zhao shared research from Boston Consulting Group, which showed that consumers in tier-two cities such as Hangzhou generally had more disposable income and higher expenditures than those in the established tier-one cities. “They’re also quicker at making purchasing decisions. Clearly we need to do more data mining and analysis so we can understand their specific needs, which vary greatly from region to region, and customise our approaches,” he said, signing off with some figures for thought. The question of how to extend distribution networks to reach these consumers was the topic for the third session of Asiafruit Market Insight. The session was headlined by Kurt Huang of Shanghai Huizhan Fruit and Vegetable Wholesale market, who underlined how Shanghai has rapidly emerged as a hub for direct imports to meet the growing demand from the Yangtze River Delta, relying less on the traditional Hong Kong/Guangzhou distribution channel. Huizhan’s quarantine and customs inspection site, which has already received approval from AQSIQ, is also set to be completed within six to 12 months, which will speed up processing of imported fruit, he noted. The challenge of how to manage volume growth and maintain sales values was a pertinent topic for some of the major exporting countries represented on the panel of speakers. Matt Crawford, corporate relations manager for Zespri China, explained how the New Zealand kiwifruit exporter, which began shipping to China in 2002, expects the market to account for 20 per cent of its total global sales by 2020. “We're going to be doubling our volume to 20m trays over a four-year period in China,” he said. “Being a cooperative we need to maintain and grow returns to our growers. For the Chilean cherry export business, the Chinese market has become a massive deal, explained Cristian Tagle, chairman of the Chilean Cherry Committee. “Five years ago, almost half our total export volume was destined for North America, but two years ago China became a big focus and almost 75 per cent of our volume is coming here now,” said Tagle.